To Belnor on the "Ships starting with B" page. Source for both pics: Bjørn Milde's postcard collection. See also this external page (Lillesand Sjømannsforening). Delivered from Armstrong Whitworth & Co. Ltd., Newcastle upon Tyne (1006) in Jan.-1926 as Belnor to Rederiet Belnor A/S (Christen Smith & Co.), Oslo. 309' x 46.2' x 20.7', 4 cyl. 2T single acting Sultzer DM (Armstrong Whitworth), 1350 bhp - sistership of Belray. Taken over by Skibs-A/S Belships Co. Ltd., Oslo in Oct.-1935. Belnor was capable of carrying heavy loads like locomotives etc. and was much sought after in the Mediterranean (please follow the link to Belray above for info on how this came about). According to Lillesand Sjømannsforening (external link), her captain in different periods from June-1935 to Febr.-1944 was Velle Gunnerius Vellesen (follow the link for information on his sea service - text is in Norwegian). He subsequently joined Belpareil. It looks like Belnor's 1st Mate Bjarne Vellesen (also external page) took over as her captain in periods when Captain Velle G. Vellesen was not on board (they were brothers). Follow the convoy links provided for more information on each (some of the listings may be incomplete). Sept. 24 Freetown   SL 88 Rendezvoused w/HG 74 Oct. 8. Aug. 10 Clyde Freetown Aug. 29 OS 37 For Takoradi. Joined at sea Oct. 19. *Page 2 gives arrival Nov. 9. Dec. 24 Clyde Gibraltar Jan. 5-1943 KMS 6 For Freetown. Apr. 15 Clyde   OS 46/KMS 13 For Gibraltar. Apr. 24 Convoy split Gibraltar Apr. 26 KMS 13 For Gibraltar. Aug. 18 Gibraltar Malta Aug. 24 KMS 23 Convoy will be added. Oct. 9 Bone Bizerta Oct. 10* Independent *Page 3 gives arrival Oct. 15. Dec. 25 Clyde Clyde Dec. 29 OS 63/KMS 37 Returned. Febr. 16(?) Detached from OS 67 Gibraltar Febr. 17 KMS 41 For Colombo. Febr. 17 Gibraltar Port Said Febr. 27 KMS 41 See link above. (stop at Gibraltar not mentioned, Page 3). June 3 Bandar Abbas Basra June 6 Independent See also Page 3 (& Page 4). Aug. 17 Port Said Bone Aug. 25 MKS 59 Convoy will be added. Sept. 17 Gibraltar   MKS 61 Rendezvoused with SL 170 Sept. 18. Nov. 30 Sunderland Gt Yarmouth Roads Dec. 2 FS 1652 Arrived w/engine defects. Dec. 15 Gt Yarmouth Roads Gt Yarmouth Roads Dec. 15 FS 1665 Put back w/defects. 1945 March 27 Clyde   OS 119 / KMS 93 See also narrative below. Apr. 4 Detached from OS 119 Gibraltar Apr. 6 KMS 93 Convoy will be added. For information on voyages made in between those mentioned here, please see the documents received from the National Archives of Norway and A. Hague's Voyage Record above. Follow the convoy links provided for more details on them, several Norwegian ships took part. According to Page 1 of the archive documents, Belnor was on her way from Capetown to Dakar when war broke out in Norway on Apr. 9-1940. Her 1941 voyages also start on this document. With a cargo of nitrates for Avonmouth, she was scheduled for the slow Halifax-U.K. Convoy SC 24 on Febr. 28-1941, but did not sail, nor did she get away with Convoy SC 26 (left March 20 - Helle and others were sunk; follow the links for details), SC 28 (Apr. 9), or SC 31 (May 9), for which she was scheduled, but finally joined Convoy SC 33 from Sydney, C.B. on June 1. Her destination is now given as Clyde, and she arrived there on June 20. It'll be noticed, when going back to Page 1, that she had arrived Halifax from Bermuda on Jan. 16-1941 and did not leave again until May 23, when she proceeded to Sydney, C.B. in order to join SC 33. According to A. Hague, the long stay in Halifax was due to engine problems. In July that same year, A. Hague has included her, along with Drammensfjord and Thorøy, in Convoy OB 346, which originated in Liverpool on July 14 and arrived Freetown Aug. 1. Her arrival Freetown is given as Aug. 3, and she had started out from Clyde on July 15. I've linked directly to A. Hague's listing for this convoy within the Voyage Record above. From Freetown, she made voyages to Lagos and Takoradi, then back to Lagos and Freetown (again, see Page 1), and on Sept. 24, she's listed (together with Elg) in Convoy SL 88 from Freetown. This convoy joined up with Convoy HG 74 from Gibraltar on Oct. 8 and arrived Liverpool on the 18th (links in Voyage Record); Belnor arrived Workington on the 19th, Barrow on the 22nd. The following month, she's listed as bound for Bathurst and Takoradi with general cargo in station 36 of Convoy OS 12, which originated in Liverpool on Nov. 18. Again, ref. link provided in the table above, Marit II (returned) and Santos are also named. Belnor arrived Bathurst on Dec. 10. Her voyages in this period are shown on Page 2. She went back to the U.K. again in March.-1942, having joined Convoy SL 102 from Freetown, cargo of manganese for Workington. Brønnøy, Cypria and Velox are also listed in this convoy, which left Freetown on March 4 and arrived Liverpool on the 26th; Belnor arrived Workington on the 29th (possibly 26th? Number hard to see on the archive document - it'll be noticed that she subsequently had a long stay in Glasgow). In May we find her, together with Athos, Kaldfonn, Mosli, Norholm and Toledo, in Convoy OS 27, which originated in Liverpool on May 2 and arrived Freetown May 19 (Belnor had joined from Clyde). With Norholm, Solfonn, Vanja, Villanger and the Panamanian Norbris (Norwegian managers), she later returned to the U.K. in Convoy SL 114, which departed Freetown on June 25 and arrived Liverpool on July 17. Belnor arrived Workington that day, cargo of manganese ore, station 82. The following month, she's listed in station 32 of Convoy OS 37, voyaging from Clyde to Freetown (arrived Aug. 29), Bathurst and Takoradi - again, see Page 2. According to A. Hague, she carried 12 Blenheims and 7 Fighters on board on this voyage. She later went in the other direction again with Convoy SL 125 (in which Alaska was torpedoed and damaged - follow the link for details). Germa is also listed in this convoy, which originated in Freetown on Oct. 16 and arrived Liverpool on Nov. 9; according to Arnold Hague, Belnor joined at sea from Bathurst on Oct. 19 and arrived Barrow on Nov. 6 - the archive document gives her arrival Barrow as Nov. 9; as can be seen, she subsequently had another long stay in Glasgow. At the end of that year I have her in Convoy KMS 6, in which Akabahra was sunk; the Norwegian President de Vogue and Athos also took part. Follow the links for more info. All the other convoys mentioned here can be reached via the external links provided within the table above. 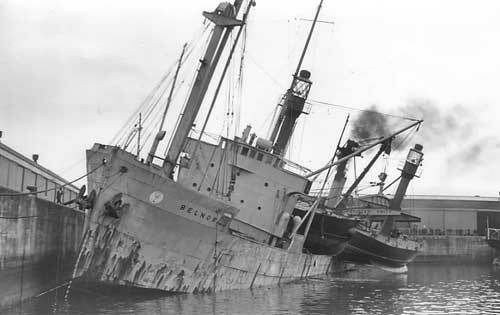 Belnor was bound for Freetown, where she arrived (via Gibraltar) on Jan. 16-1943, having sailed from Clyde on Dec. 24. Page 2 and Page 3 show her subsequent voyages, with convoy info for some of them in the Voyage Record above. Skipping now to Apr.-1943, when she's listed in station 43 of Convoy OS 46/KMS 13, voyage Clyde-Gibraltar with coal and small craft, arriving Gibraltar on Apr. 26 with the KMS* portion, having sailed from Clyde on Apr. 15. Bollsta, Brisk and San Andres are also listed. Belnor now appears to have remained in Gibraltar for almost a month, before she went back to the U.K. in Convoy SL 129/ MKS 13, which arrived Liverpool on June 1. Belnor had joined at Gibraltar on May 23 with MKS 13* which had rendezvoused with SL 129 from Freetown on the 24th. The Norwegian Fernhill, Heimvard and Vest are also named. Belnor now remained in Liverpool for several weeks. What follows is from an article in "Tilbakeblikk", written by Gunner Arne Thommessen, who later paid off while in Glasgow and joined Topdalsfjord on Febr. 3-1944. (Some of the dates don't quite match up with what is found in the above Voyage Record). On July 28-1943 Belnor left Glasgow for Oban to join a convoy for Gibraltar (see Convoy KMS 22). Gunners for this voyage were: Ingolf A. Rosendahl, Gunnar Solås, Helge Nolum Hansen, Ellias C. Kvamsøe, Sigvald P. Knutsen and Arne K. Thommessen (previously of Bosphorus and Kong Haakon VII). Her armament consisted of a 4" QF American gun and four 20 mm Oerlikons, as well as rifles. She had a general cargo in addition to 2 tugs and 4 barges on deck. Though there were several reports of possible enemy presence, the convoy arrived Gibraltar without incidents on Aug. 9*. Most of the ships in the convoy continued to ports in the Mediterranean (see the second table on my page for KMS 22), while Belnor remained at Gibraltar awaiting a convoy for Malta. By that time several ships had been sunk by limpet mines, among them Thorshøvdi, which was clearly visible to them, so the gunners were equipped with rifles and depth charges and all on board were told to keep a look-out for suspicious movements in the water around them while at anchor in Gibraltar. *It'll be noticed, when going back to Page 3 that the document says "put back Gibraltar", indicating this was not her original destination. Also, as will be seen when following the link to my page about KMS 22, A. Hague has a note in his listing for this convoy saying that Belnor put back to Gibraltar with defects. There's quite a bit on Belnor in my text for D/S Fana (scroll down on that page), however, some of the information conflicts with the details given here. Also, my Warsailor Stories section has the story of someone who was on board Belnor at this time - text in Norwegian only. Finally, on Aug. 18 they left Gibraltar for Malta in a large convoy (this was Convoy KMS 23*; Facto and Tigre are also listed). Several of the ships had Oran, Algiers, Bone and Bizerta as their destinations. The convoy was attacked by aircraft off Bizerta on the 4th day and again the following day, but Belnor arrived Malta unharmed on Aug. 24. The tugs and barges were unloaded and she was ready to leave Valetta again on Aug. 29 in a convoy for Bone. Shortly after departure Belnor experienced problems with her main engine and had to stop for a few hours, then returned to Valetta to get the problem properly seen to - note that she's mentioned in connection with Convoy MKS 23 (scroll down to the second table on that page), with a note saying "returned to Malta" - see also Page 3. En route, a formation of aircraft was spotted and all guns manned but to their huge relief they turned out to be British. They also experienced another nerve racking sighting as they approached Valetta, namely a group of warships. These later proved to be part of the Italian fleet which had surrendered and were headed for Valetta. After her engine had been fixed a few hours later Belnor again departed Valetta, this time in the company of 3 other ships. On Sept. 1, when the convoy(?) was off Bizerta they were ordered to go in to await further orders. Several other Norwegian ships were also there, which proved advantageous for Belnor because her food supplies were running low. These ships had come from the U.S. and therefore had more supplies, so Belnor's steward was able to supplement his own stock. Finally, on Sept. 17 they could leave Bizerta and arrived Bone on the 19th, where they started to load ore with the help of Italian POW's. They also took on board some damaged war stores, leading them to suspect that they were headed back to the UK, which they did not mind at all. While at Bone they also met some British soldiers from the 8th Army, waiting for orders (possibly for Italy) who happily accepted an invitation for dinner on board Belnor. Having taken part in the advances through Libya and to Tunisia, they greatly appreciated the efforts and skills of the Norwegian cook. After 3 weeks in Bone, Belnor sailed for Bizerta, arriving Oct. 15. Landing barges were now loaded for 3 days (these were going back to the UK for overhaul). They all had a feeling that an air attack might be imminent; the harbour was full of ships waiting to be escorted to the Italian front, loaded with war stores, ammunition etc. Others, like Belnor, had orders for Gibraltar, while others still - several Norwegian - were in service on the North African coast and to the Italian front. All of Belnor's guns were overhauled while they prepared for the attack they knew would come and when it did, Belnor took part in the defence for 2 nights in a row, receiving slight damages. On Oct. 18, she was ordered to head out and meet a convoy of about 25 ships en route from Italy with destination Gibraltar. As they passed Oran on Oct. 22, 4 Liberty ships joined the convoy, and no sooner had they taken their place than the convoy was attacked by torpedo aircraft, 4 of which were shot down, with Belnor's gunners responsible for the destruction of one of them. The convoy arrived Gibraltar on Oct. 24-1943 (this was Convoy MKS 28, in which she's listed as bound from Bizerta to Gibraltar - scroll down to the second table on that page. See also Hallfried). She departed Gibraltar on Nov. 3 (Convoy MKS 29, together with Sirehei and Norvarg), but again experienced some engine problems so had to stop, but it was fixed within half an hour and she was able to rejoin the convoy. U-boat reports were given twice on this passage, but nothing further happened. Before arrival North Channel the convoy split up, some ships heading north, while Belnor and some others headed for the Clyde, her destination being Glasgow, where she arrived on Nov. 18 (Page 3), having been gone for almost 4 months. 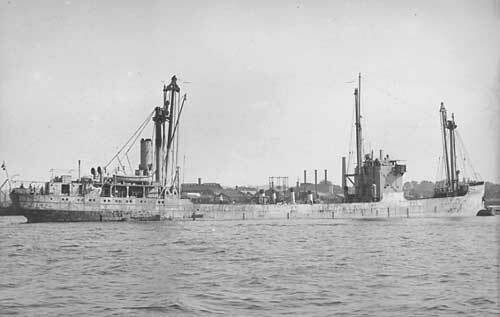 Some of the gunners now paid off and new ones came on board for yet another Mediterranean voyage, departing Dec. 25, joining a large convoy on the 26th, but again Belnor experienced engine problems and had to return to Clyde after the engine crew had worked through the night to get her going (this was Convoy OS 63/KMS 37* - ref. link in the table above; several Norwegian ships are named. Belnor had a cargo of steel rails). She arrived Greenock on Dec. 29, and on Jan. 16-1944 they arrived at a yard in Glasgow for repairs. As mentioned, Arne Thommessen paid off while in Glasgow and joined Topdalsfjord on Febr. 3-1944. More details from his article can be found on my page about this ship. Following repairs, Belnor left Glasgow again on Febr. 4-1944, joining Convoy OS 67/KMS 41, which sailed from Liverpool on Febr. 6 and split up on the 15th, the KMS* portion arriving Gibraltar on Febr. 17, while the OS convoy continued to Freetown, with arrival there on Febr. 26; Belnor arrived Port Said on Febr. 27. Her subsequent voyages are shown on Page 3 and Page 4; convoy information for some of them can be found in the Voyage Record above. In Aug.-1944, she made a voyage from Port Said to Bone with Convoy MKS 59*, arriving Bone on Aug. 25 (Helgøy, Hjalmar Wessel and Liss are also listed in this convoy, which later proceeded to the U.K., having joined up with Convoy SL 168 from Freetown on Aug. 30, but Belnor was not present at that time). She left Bone again on Sept. 14, joining Convoy MKS 61*, arriving Algiers on Sept. 15 (with defects, according to A. Hague), continuing to Gibraltar that same day in order to head back to the U.K. MKS 61 had started out in Port Said on Sept. 6 and arrived Gibraltar on the 17th, leaving Gibraltar that same day, joining up with Convoy SL 170 from Freetown on Sept. 18, the combined convoy SL 170/MKS 61 arriving Liverpool on Sept. 26 (Belnor was in the MKS convoy). Her voyage information is given as Bone-Manchester, carrying Churchill tanks - she arrived Falmouth on Sept. 24. Novasli, Somerville and Sophocles also took part in this convoy, having started out in the SL portion from Freetown. Again, please see Page 4 for a listing of her subsequent voyages, with convoy details in the Voyage Record above. As can be seen, she later spent a long time in Sunderland, with another long stay in Glasgow, where she had arrived on Dec. 27-1944; departure is given as March 26-1945. According to the external website that I've linked to at the end of this page, she had been scheduled for Convoy OS 112/KMS 86 on Febr. 22-1945, but did not sail. She had also been cancelled from the next convoy, OS 113/KMS 87, as well as OS 114/KMS 88 and OS 115/KMS 89. She's listed as sailing in Convoy OS 119/KMS 93, which originated in Liverpool on March 28 and split up on Apr. 4 (I've linked to A. Hague's listing for this convoy within the Voyage Record). Belnor, carrying vehicles, joined from Clyde (KMS portion*) and arrived Port Said on Apr. 16. Again, please go back to the Voyage Record (and Page 4) for information on the rest of her 1945 voyages. See also Page 5, showing voyages to Apr.-1946. * The KMS and MKS convoys will be added to my own Convoys section in due course; in the meantime the ships sailing in them (and escorts) are named at ships in all KMS convoys and ships in all MKS convoys. For more information on the other Norwegian ships mentioned on this page, please see the alphabet index below, or go to the Master Ship Index. Sold to Denmark in May-1956, renamed Lise for D/S A/S Nautic (Aage Vollmond), Copenhagen (a 6 cyl. motor had been installed in 1947, 1350 bhp). Sold in June-1959 to Ioanna Cia. Nav. S/A, Piræus and renamed Ioanna. Sold in 1966 to Alma Horn Shipping Co. SA/Syros Shipping Co. S/A (L. M. Valmas & Son Ltd.), Piræus. Had an engine explosion on Sept. 20-1966, on fire, capsized and sank off Arzew on the 22nd. OS/KMS Convoys - As can be seen, Belnor is listed as scheduled for Convoy OS 112/KMS 86, OS 113/KMS 87, OS 114/KMS 88 and OS 115/KMS 89. Back to Belnor on the "Ships starting with B" page. Other ships by this name: This company has since used the name Belnor for several of their ships. One was delivered as such in May-1959, 10 527 gt, later sailed as Dora for owners in Monrovia from 1968, before she ran aground on Aug. 23-1971. Another was delivered to the company in Sept.-1971, 22 488 gt, sold to China in 1977 and renamed Lui Lin Hai. Another had originally been delivered in March-1977 as Melsomvik for the management of Simonsen & Astrup, Oslo, 22 960 gt. Sold and renamed Nordbulk in 1979, becoming Belnor in 1983. Later names: Stove Campbell 1986, Western Bell 1987 (Philippines), Alara 1987 (Turkey), Constantinople 1992 (Valetta), Constantinople Naparano same year, Al Waaliyu 1994 (Panama). Additionally, another Belnor was delivered in 1996, 26 449 gt, still in service. The text on this page was compiled with the help of: Misc. sources, including Arne Thommessen's article mentioned in the narrative; info from the book in question is used here with permission - ref My sources.